The G-Plan brand was launched in the 50s. It defined modern furniture from the 50s to the 70s. In those days 'G-Plan' was a generic term for modern furniture in the way we still use 'Hoover' for vacuum cleaners. G-Plan was not cheap, but it was the brand most people aspired to own. After many years of neglect a new generation is discovering G-Plan again. Vintage pieces are commanding high prices. People are finding that furniture from the 50s and 60s and particularly G-Plan, was better made than antique furniture and looks stunning in a modern setting. G-Plan was the brainchild of Donald Gomme. The family firm, E Gomme, had made traditional style furniture since the Victorian age. In 1952 he brought the firm up-to-date when he launched G-Plan. G-Plan combined modern style, a national brand name and a clever concept - interchangeable furniture. Before G-Plan, furniture was only available in suites for the bedroom, dining room or living room. G-Plan changed furniture buying forever. Now people could buy as much or as little G-Plan as they wanted. They could buy one coffee table or a complete G-Plan look for the whole house. The first G-Plan range was called Brandon. It was finished in light oak and in the contemporary style of the early fifties. It had a light look and feel, tables chairs and even heavy wardrobes and sideboards appeared to float off the floor. This affect was achieved with splayed legs and a simple, uncluttered look; both were key styling points for early fifties contemporary. G-Plan borrowed much from designers such as Robin Day, who pioneered contemporary furniture design. G-Pan was, though, aimed at a much wider audience. Gomme updated the style of G-Plan throughout the fifties, sixties and seventies. The original light look of Brandon gave way to darker tola, or African mahogany. In the mid to late fifties there was a fashion for black ebonised legs and brass fittings. G-Plan followed this trend and upgraded its furniture with a glamorous look. Initially, Gomme's success did not last into the early sixties. For G-Plan, 1960 was a bad year. The new G-Plan range for 1960 was not inspiring; it was yet another variation on tola, black and brass, which was already old fashioned. Gomme introduced numerous different designs in an attempt to recapture the magic G-Plan formula. The severe and functional Limba bedroom range, designed by Leslie Dandy, ought to have been a best seller. Limba was veneered in a straight grain wood to make matching easy, but it stood on metal legs and looked a little like office furniture. The trade loved it; the public hated it. Limba was too advanced for its time; retailers soon cursed it as they were stuck with pieces of the unpopular Limba range in their showrooms. "Lumbered with Limba", was a phrase in common currency. Although Limba was a disaster for Gomme, the firm had one notable success in 1962. It introduced a large, rounded swivel armchair with wings. It was available in several fabrics, but the buttoned black vinyl was a sixties style classic. This chair was very much a male thing; it could have come straight out of a James Bond movie. It was the chair that Michael Caine as Jack Carter, knocked Cliff Brumby into in the classis film "Get Carter". The inspiration for the chair was probably Arne Jacobsen's Egg Chair of 1958, which was similar in shape, but plainer. Gomme proudly proclaimed that it was the World's Most Comfortable Chair. G-Plan went Danish in 1962. In an attempt to stop losing sales to Scandinavian imports, they hired their own Danish designer, Ib Kofod-Larsen. He designed a complete new range for Gomme, G-Plan Danish, in 1962. The highlight of the range was a 7 ft 6 inch sideboard in teak, which had unusual square rosewood handles. It was in the latest fashion of the era and looked stunning. The G Plan Danish sideboard sold for 61 10s [897 in todays money], which was rather expensive for a mass-market piece. In the late sixties, the sculptured look was the new fashion and G-Plan led the market. They introduced their most successful range of teak furniture, Fresco, in 1967. G-Plan Fresco featured deeply sculptured handles and legs, combined with strongly patterned teak veneers. The new G-Plan Fresco dining set for 1967 had an extendible circular table and four dining chairs with padded circular seats and backs. The circle theme was a favourite of mid-sixties' design. The chairs had sculptured legs finishing in a circle at the top and bottom. The sideboard was large at 7 ft in length. It had the distinctive sculptured handles, which on the drawers appeared to imitate a smile. Fresco was for the bedroom as well as the dining room. There were Fresco wardrobes and chests of drawers, as well as a new dressing table. The dressing table had a special hidden drawer for jewellery. At 5 ft wide, it looked very impressive in the right room. Gomme continued with teak designs in the seventies. The Company positioned itself at the top of the popular market. The emphasis was on design and quality, rather than price. ATVs popular game show "The Golden Shot", hosted by Bob Monkhouse, assisted by Anne Aston, offered a G-Plan Fresco dining suite and a G-Plan reclining chair as prizes in 1971. This article is adapted from The G-Plan Revolution by Basil Hyman and Steven Braggs. See also The High Wycombe Furniture Archive which contains an extensive collection of images from the history of the furniture trade including a large selection of G-Plan images. "I have a teak sideboard, I am fairly sure it is by Ib-koford Larsen but I am not totally sure. It's the sideboard on the poster for 'Younger' 746 Fonseca in your retro sideboards page. I am trying to find out if it has any value! It has a younger tag on the back of the top drawer. many thanks." Josh "p.s. what a fantastic website!" Hi Josh, The sideboard is manufactured by Younger. It is not G-Plan and won't be designed by Ib Kofod-Larsen. He designed for Gomme, i.e. G-Plan. It may have been by John Herbert who was Younger's design director in that period. Younger was more expensive than G-Plan, and was very high quality furniture, not quite in the Gordon Russell, or Archie Shine league. "Hi, I am a loss trying to find out the name of my parents G-plan dining suite. It is a large mahogany table -which extends. The chairs are cushioned with a velour dark beige and brown 'zig zag diamond pattern. There are two carvers and four regular chairs. They have a slatted back. They also bought a rectangular coffee table , nest of tables and corner crystal display cabinets and two drinks cabinets. They are all mahogany. My parents are looking to sell some of the suite, so I would be grateful if anyone had any info, or would know anywhere near East Grinstead that may sell/buy retro Gplan? We have a whole bedroom suite of G plan fresco. Do you know an interested collector please?? I have a dining suite with 4 chairs. The table is 137cm long and extends to 188cm with the leaf inserted (you pull either side of the top to slide out ti insert the leaf). It is 117cm wide. It is teak on the top but the underframe and legs are ebonised. There is a brass cup at the end of the tapered leg. Each chair is slat backed and has a "bitter chocolate" velour seat. Under the table on each section is a stamp impressed 105 with a 1 next to it. I have been unable to sell a late 70's G-plan fresco dressing table with mirror,in good condition, for the past year or more.Valuers/auctioneers in this part of North Norfolk say there is absolutely no demand for retro teak furniture and I may as well dump it.Can this be true as it is, sentiment apart,still to my mind a splendid piece of beautifully styled and rich coloured teak bedroom furniture. Simply too large to fit into our bungalow. We bought G-Plan furniture in the 1950's when we married. a 3-piece suite,then later on the Fresco units,which we still have. They are still as good as new. I have G Plan 3 mirror long dressing table, centre shelf - two sides, one two drawer side, one small cabinet side...has had custom glass top since bought in 1068/9 - at furniture store in Dorchester, Dorset. It has trademark oval one piece 'legs' each end. Immaculate condition. I got a wardrobbe and dressing table of e.bay.It is old but very stylish i am 47, anyway i noticed on the left hand drawer on the dressing table had a g.plan gold stamp,is this of any significance at all on the item age is it valuble are you able to help,thankyou look forwoard to hearing from you. Use steelwool #000 wetted with teak oil, and simply rub very lightly in the direction of the grain until the scratch is gone. Apply teak oil to a soft cloth and rub the entire piece of furniture to get the same finish all over. Polish the entire piece with a dry cloth. My son has been left some g-plan furniture.The sideboard is long, with polished brass feet, bi-fold doors at either side,(one needing a small repair to the slider), and drawers in the centre, the top one being a cutlery drawer.They have hinged brass handles. The dining table, when fully extended on its eight black legs,( with brass feet matching the sideboard), is an attractive ovoid shape. The wood appears to be teak, and both pieces have the gold G-plan stamp.The sideboard also has a stamp with manufacturers info including a year, possibly 1960.The surfaces are a little faded but otherwise in good condition. There are four woven-seat dining chairs in excellent condition, but these have no visible maker's mark that we can find, so I'm not certain whether these match the set. I think we may have the g-plan reform 3-pce suite. Is there a picture of this anywhere to check. Also, what would the frame be made from, as we want to decide if it is worth restoring, as it will need new springs, fillings, covers, legs! I have a retro G-Plan Dining Table finished in teak, six chairs and two dressers that are joined by an overhead cupboard, 1960's. Would the black leather actually be real leather on the chairs? I am having to dispose of the whole suite as I am down-sizing. A lot of money in those days. Where can I get my extensive inherited G plan furniture restored... It's perfectly sound but very stained and very, very smelly. I have a chest of drawers(tollboy), dressing table (with sconces) or should that be distressing table (it's quite spoilt), with stinky felt interior and 2 bedside tables(which look awful), 1 large ladies wardrobe and 2 coffee tables(bought 2nd hand). Any ideas anyone? I'm based in S/East London and have transport... Cheers. The sofa above is G-Plan Danish. The designer is Ib Kofod-Larsen. I have found that eBay is the best place to buy G-Plan. However, I'm not sure how much of it there is in the US. You might want to look for Danish furniture, which was popular in the US from the late 50s to the 70s. I would still say eBay. Make sure you have good quality photographs, a good description and a realistic starting price. All G-Plan would have have had a red G-Plan sticker or a gold emobsed G-Plan brand when it was made. Gomme was very proud of the G-Plan brand. That doesn't mean the stickers might not have come off. Enjoyed reading your overview, did g plan make any purpose built office desks as I have a black plastic topped what can only be described as a standard office desk with 2 drawers to the right side. Unlike a lot of the desks which are really dressing tables on ebay this has handles on the drawers which I have seen on a koford larsen ? piece on the net. Thanks in advance for your help in identifying this g plan piece. NB. The G plan mark is quite faint not gold and looks like the capital letters E & G are also printed on the inner section of top drawer. I don't think G-Plan made office furniture. Most of the 'desks' I have seen have seen are the Fresco dressing table with the mirror removed. You can always tell, because the Fresco dressing table had a jewelery drawer which you can see at the top of the desk. I have G plan 8 drawer G plan Bedroom Drawers white front drawers teak main casing. Dark wood corner cupboard and two bookcases 1 with glass front 1 with wood doors. Where is the best site to sell and what price should I let them go for? "I need to sell g plan furniture within the next 2 weeks. I have a sideboard, drop leaf table and 4 chairs i think they date from the 1970s. How much should i ask for them? i am unsure of a GPlan label for IB Kopod Larsen. It has the gold embossed GPlan logo with Danish Design in caps below, his signature (which is under the GPlan logo not the left hand side) but no mention of made by Gomme High Wycombe Bucks.Please advise. I have some G-Plan pieces and the label is G-plan in gold on a deep red background. What about this label? "Hi Ive just bought a G-Plan bedroom suite. Two wardrobes, two bedside cabinets, dressing table and a headboard. All finished in grey (melamine?) with a painted rose pattern. I cant find any reference to anything like this at all. Please can you advise what its worth how best to look after it. I have just seen a G Plan wardrobe that is painted white with lilac doors. This is advertised as having been originally bought from G Plan painted - is this correct? How can I found out what the orginal fabric looks like? I've recently bought a sideboard on ebay very cheap and have found out it's got the G Plan gold stamp. For the most part it's okay, but one shelf is missing and 2 drawer handles are chipped. I've been searching online for G plan salvaged parts to no avail. Do you know of anywhere I can get replacements for these? Can you tell me if G plan did furniture in 60's/70's with square brass handle with a circular hole in the middle? Not sure if what we have is G plan or not. It's the right era and quality furniture but can't see anything similar on e-bay for G plan. "I have 4 chairs model 4582s dining chair new season cover 6947 ivory 100% hide with g plan red & gold embosed stamp.They our black with ivory leather seat, back is one piece of flexable shape wood, base u shaped black wood.Can you help me with the age and designer. "We are looking for a chest of drawars to match our GPlan Red Label bedroom furniture which was purchased between 1965 - 1968. One wardrobe has the code number 1195. I have a chest of drawers that I believe originally had a mirror attached too. It has 4 drawers and is a pale wood - possibly oak, with a darker veneer casing. It has a gold and black label inside the top drawer on the right hand side - not one of the labels faetured on your web page - it says EG and below says 'Gomme furniture Wycombe'. there is a samll picture of a building and trees at the top of the label. Inside, the top drawer is divided into 3 sections. There are no legs or feet on the furniture. The handles are rectangular and ridged, but not like others I have seen on G-plan furniture. It is chunky, solid and in good condition. Is this an early G-plan? "Hi I have a G-Plan bedroom suite. Two wardrobes, and one dressing table. All finished in grey (melamine?) with a painted rose pattern. I cant find any reference to anything like this at all. Please can you advise what its worth and what is the name of the design. I have purchased two G-Plan sideboards in pretty bad condition that I'm going to revamp. I have to remove the handles to do this but they're moulded so I'm a bit stuck. Any clues how I might extract them ? I have recently purchased a second G Plan room divider, can anyone tell me where I can purchase the brass adjustable feet that are missing. "Hi, we have recently inherited a lovely dining table and 6 chairs. We believe they are G plan but can't find anyhing about them. The table is a teak colour and has a double row or orangie brown tiles running down the length of it. I have searched the table for a sticker or stamp but can't find one. Is anyone able to tell me what the name of this piece of furniture is at all? Did it have the G-Plan red label? I'm not sure it is piece I recognise. The sides, doors and top would have been in teak veneer. It's quite hard to tell with G-Plan as it is so well made. Solid parts such as legs were made from afrormosia, which has a similar colour to teak, but is easier to work. It should not be cleaned with Pledge, or similar. Just dust and very occasionally refinish with teak oil. I am looking to buy a g plan Astro coffee table and have found one at a bargain price, however the description whilst it says g plan alos says 'teak finish' - do you know if there were teak wood finishes or fakes made of this table? It looks good but lighter in colour than what I am used to seeing.PS.Good site thank you. "All G-Plan furniture was 'teak finish' rather than solid teak. This really meant teak veneer. The solid parts, i.e. the legs would probably have been made in afrormosia, which looks like teak, but is easier to finish. i've bought a 3 door "fresco" wardrobe and just waiting for it too be delivered in a 2 days time. i am a little worried i may not get it up to my first floor flat,in one piece due to size restrictions. how easy is it too dismantle?any tips on the best way too proceed to minimize damage? is there a printable version of the original set up instruction manual you could put me onto? "I have a G-plan Circular extendin dining table, $ chairs and a carver. Table and 4 chairs are water damaged and I am looking to renovate. Carver and extending leaf shows standard I have to achieve. Any tips for preparing and renovating also for finishing laquer. I have looked a lot online for some hinges for the folding doors on a 3 door fresco wardrobe. I bought one about 8 months ago and love it but it came without 2 of the hinges needed for complete assembly. I don't suppose you would know where to get replacements? G-Plan made very little office furniture. These desks are often converted from dressing tables. Yours does look like one of those. Have a look at the G-Plan Quadrille bedroom set here http://hwfurniturearchive.bucks.ac.uk/asset-bank/action/viewAsset?id=1437&index=144&total=235&categoryId=455&categoryTypeId=1&collection=1960-1969&sortAttributeId=39&sortDescending=true. Your desk looks similar to the dressing table without the mirror. "Looking for some GPlan bedroom furniture specification help. Have panels back of wardrobe mirrors and drawer fronts painted light grey/mushroom.It will be late 60' or early 70's Gold embossed stamped design Trying to establish if paint is lead free.We are seeking to dispose of late mother-in-laws furniture but no one will take and put to use unless lead free.Other option is to skip which I am very loath to do as there is lots of life left in it etc. what a great site you have with loads of informatiom. "We've recently moved into a new house and have been left some furniture, one piece being a nest of tables with the g-plan sticker underneath and the number 26 in all three, does this relate to the style? There are a couple of cup stains on one and I was wondering how best to clean them and I notice you say the best place to sell them is on e-bay but I've had a quick look and the prices are quite varied and wondered if you could give me a rough idea how much they are worth. "Hi, I have just purchased an e gomme dressing table and matching set of drawers. They're exactly like the tola and black range but the drawers are all white, with the earlier 1958 brass handles. I have looked online but cant find any similar pictures. Does anyone know what this range was called and when it came out? Is it just a variation on the usual tola and black? Your best bet is to find a tatty one (you could try eBay or your local paper or charity shop) to salvage for parts. No-one re-manufactures parts for vintage G-Plan. G-Plan Garrick dates from the 1980s. For some more designs see http://hwfurniturearchive.bucks.ac.uk/asset-bank/action/quickSearch?keywords=garrick&newSearch=true&quickSearch=true. As to values, based on eBay sales - bedside tables - Â£30, wardrobe - Â£50. I've not seen a dressing table, but I guess Â£50 to Â£100. eBay is the best place to sell. Have a look at completed listings to get an idea of value. Remember condition is very important. "Hi I was given a lovely set of g plan drawers when I was 21, now 30 yrs later I still have them. The style is teak I think they have 8 drawers , on one side they are a tad smaller adn larger drawers on the left. They did have brass plates on the handles and looped drop handles which I replaced with new brass ones and got rid of the brass plates as they kept falling off. The drawers also have brass feet. The part where the legs are is sort of hovering separately to he base with a nice shape. I restored the top carefully and it is now in very good condition, In your opinion is this worth holding onto,... My hubby wants me to sell it but I do stil love it, We are downsizing and moving into a caravan to travel for a while and he thinks it would be not worth it to put it in storage. Can you help solve the dilemma. "Fresco was teak veneer finished with teak oil. I don't think they used varnish. 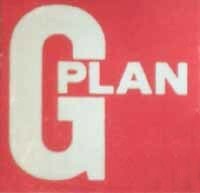 G-Plan used a either a red label or a gold embossed stamp to indicate their brand. G-Plan pieces will have one of these. The red labels do come off. The gold stamps do not. See the collectors' guide for pictures of the stamps (follow the link at the top of this page). "Hi John, I would say that the sideboard would be worth around Â£300 to Â£400. The chest of drawers, probably Â£200 to Â£300. Condition is of supreme importance and tatty pieces are worth a lot less. Bonhams have sold G-Plan in the past you might want to enquire. Alternatively, eBay is the biggest market for G-Plan. Look at recently sold items to get an idea of starting price and take some good photos. "Hi Christian, Whoa! That's going to be difficult. There was little if any furniture imported from Japan to the UK in the 60s. I would have thought it was made for the Japanese market. If you know the manufacturer you could try searching for the name on google. Alternatively go to library that has a searchable collection of international news papers. You cold try searching the archives of the Cabinet Maker for 1963 to see if there was any discussion of Japanese manufacturers. "I have a cream G Plan suite consisting of 1 armchair, 1-2 seater settee, and 1-3 seater settee, all bought mid/late 1980s. The units have 6"/8" legs in 'teak' and the fabric covering to arms, frame, and cushions looks like a sort of Dralon. I think your quest will be difficult. It might be worth looking in Homebase to see if something similar exists. Otherwise try to buy some scruffy chairs with these fittings on eBay. You might find that the cheapest option. If you can get the chairs for virtually nothing, or they didn't sell you might persuade the vendor to send just the fittings so saving on postage. "Hi, I have 4 G Plan period chairs and would like to know what the design is called and an idea of value as I have not seen these for sale anywhere on line. I can send a good photo if you can help. I recently bought a bookcase from ebay and I was told it was g plan but I have my doubts. The bookcase has four spindly legs not carved, it has two glass sliding doors and two drawers underneath. It has handles set in to the wood that your hands go up in but they are not very deep. Could you let me know if they made a bookcase like this. "Hi, we have a G PLAN sofa that I bought at a market for 100 quid. I can't seem to find anything similar. It has a red G PLAN sticky label. It is a three seater with curved arms. The back is three separate curved pieces of plywood. Any knowledge of this piece or what it's worth? "Hi I have teak 'astro' style low coffee table. It looks like G Plan but has a small bold black capital B with a box around it stamped underneath the table. I inherited (read saved from being thrown out) my mums old sideboard when she decorated her dining room and it consists of two side opening doors on the left hand side, a flap in the middle that hides the drinks area and three draws on the left. One of the 2 oval hinges on the flap section has broken with age, can you recommend anywhere I can get replacements. this site seems to have becoming the closest thing I can find to a g-plan furniture owners' forum! Perhaps someone should set one up properly! Anyway, I scored a beautiful set of Fresco wall furniture on ebay, including bookshelves and drinks cabinet, all of it with cabinet lighting. Here's where I feel stupid though: I can't for the life of me work out how to remove the old bulbs from their holders in order to change them. You wouldn't have any ideas would you? I purchased a second hand coffee table last year and have since discovered it is identical to a teak gplan tiled top coffee table. Everything is exactly the same, the tile design, the teak finish and build. So much so I was convinced it was genuine until I couldn't find the gplan mark on the underside. Is it possible that the mark fell off and if so, is there any other way to prove its authenticity? I have recently inherited an old g plan coffee table from the sixties. I think it's teak. The top needed sanded back as it was stained and washed out with age and use over the years. I want to restore it to look as it did originally. Do you know what finish is on the wood? Is it varnish or oil? "Hi, I've just acquired a small gplan sideboard. Unfortunately the shelf supports have been lost and the shelf is currently held up by an assortment of screws! Anyone know where I can get replacement shelf supports? It's condition is ok the frame is perfect and the seat covering is ok but the inner seat padding is soft and the seat webbing has become brittle. what is your view about repair or reupholstery. I am not sure of the chairs value, and how mush it would cost to have the work done. Do you know of any experts in mid century furniture . I would welcome your thoughts. I am in a dispute at the moment on E-Bay.I asked the person if the coffee table had a gold sticker underneath .. his reply .. Yes, a bright Gold sticker, I asked for a photo, and it is a Red and White sticker, he still says the word G Plan is in gold .. is this possible. "Hello. Firstly I'd like to thank you for taking the time to read me e-mail. I have recently purchase an extending g-plan dining table with matching butterfly dining chairs and coffee table. The Dining table top needs a few scratches and a hot plate mark removing, its a natural teak finish which id like to restore, is this possible and if so what approach would you recommend so as to not devalue the dining table. The chairs are in good enough condition but needs some TLC. With one the connections joining the legs at the front has broken, I can see that they are wooden plugs connecting the legs. My though was to replace these plugs with the equivalent available today in the UK, but in order to achieve this i have to drill the old ones out as they are firmly wedged in. Will this effect the value of the chair, do you have an alternative method? Last question, the chairs as mentioned need a little TLC, the black leg paint has flaked off, I would like to rub down the old paint and re-paint with the same black paint they used, please could you let me know what that was and if it is still available and where i could purchase it. Thank you again. I very much look forward to hearing from you. "I have four G plan teak dining chairs with upholstered seats which I wish to dispose of. They were made in 1976 and do not have fire safety labels. It seems that it is illegal to sell them, and charities can't accept them. Can I check if G Plan complied with fire safety tests before 1976 and obtain proof? Can I even give them away without fire safety labels? "Ian, thank you for your trouble. We have today given the chairs to a friend. The upholstery is split and they would really need repairing to sell. I'm pretty sure it is illegal to sell any furniture without fire safety labels. I realise stuff is sold on Ebay, but Ebay would probably say they aren't breaking the law, they are not the sellers of the items. If the chairs are re-upholstered they would be kosher. "Hi, I have the opportunity to purchase a Kofod Larsen sideboard (number 4022). It's in excellent condition, bears the gold stamp and is available at a very reasonable price. The only issue is that rather than the usual square rosewood handles it has round metal (brass I think) ring handles. The current owner didnt change the handles but bought the piece second hand about 30 years ago. I assume they are not original but I wanted to check if G PLAN ever manufactured them this way? I would like to reinstate handles as close to the original as possible so I wondered if you might know their dimensions? Also if you happen to be able to suggest somewhere who might be able to supply them that would be fantastic. Thanks so much for getting back to me. That's hugely exciting as I really didn't think there would be any chance of sourcing originals! I have now purchased the sideboard & it's lovely but if you are able to provide the handles I would be enormously grateful. All the handles have been replaced so I would need 8. Is that possible? "Where can I purchase wardrobe door hinges for my G-plan wardrobe? "Hi, I have just purchased what was described as a G Plan Fresco 1961 side board and display unit.Our seller is adiment that this is a genuine G Plan item and has been in her parents home since 1961. You have stated that Fresco was only introduced in 1967. We have discovered that the drawer internals are plastic and the hinges are exposed on the doors inside, much the same as the fittings on the doors in my kitchen units. Please can you advise. Your site is extremely informative. Fresco was not introduced until 1967, so it can't be 1961 and Fresco. The cupboards would not have had modern kitchen unit style hinges. I have come across people who are convinced that some piece of furniture is G-Plan when it isn't. It is sometimes what their parents told them. Probably a genuine mistake. Get in touch with the seller and explain if you are not happy. "Hi,I have 3 pieces of 'Tola and Black' G plan furniture from the 50,s. Would anyone know what the black Lacquer is and how to get hold of it? "I have recently acquired some dining chairs which have the IB Kofod Larsen stamp and a table which I presume is also G plan although no sticker. The chairs are in fairly good condition but need some tlc, especially the back rests which are quite worn on the top. I am unsure how to refinish them, I have been reading about using teak oil but am unsure if it is ok to use over the existing finish. The table needs sanding right back as it is quite faded in parts. It will be for family use so I am wondering if it is ok to varnish or better to stick to oil. I recently purchased a g plan fresco bedroom suite at auction.Unfortunately there are some scratches on both the double and triple door robes, the bi fold mechanism is also a little noisy when used.Any suggestions as to how to restore the doors ( would teak oil or briwax work ? ) and make the mechanism smoother? I've used your website many times and found it very helpful(thank you). However,I have chair that is like the G-Plan Most Comfortable Chair but it more stylized,like a Comma and I have not seen another one like it. Can you please help and tell me something about this chair? I've taken some photos and put them on One drive. The chair is leather and I believe it to be from the 1950's or 1960's. Sorry I don't know. Quite a few manufacturers made what were called 'Status' chairs in the second half of the sixties following the G-Plan style. It looks to be vinyl rather than leather. Are there any marks which could identify the manufacturer? "Hello, we have recently bought a circular extending dining table which has coloured naturally but the central leaf hasn't coloured at the same rate. Is there any way of bringing the two sections back to the same colour? I have inherited my Grans g-plan sofa, arm chair (matching which are IB Kofod-larsen Danish collection), and 2 TV chairs (also K-larsen, but the stamp has been removed). All bought in 62/63. They are in need of refurbishing - but i wondered what they should be worth in an imperfect condition. I am looiking for a New Seasons white ash dining table and chairs. Would like to view before buying. "Hi I have a G plan round extendable dining table and four chairs Al Fresco .My question is....the leaf carries the G plan Red sticker but also has a number stamped on the opposite end -384 what does this mean? I have come across a very attractive small GPlan cupboard. I think it is from the 1950s, and looks as though it is made of oak. Unfortunately the doors and cupboards have been painted, and the finish on the wood is scratched and damaged. I would like to restore and refinish this as close as possible to the original. I was thinking about paint stripper, followed by a light sand, and then re-oiling. Is this the right approach? What oil should I use? "Can you advise on whether the rubber seat pads on a G plan 3 piece settee are available somewhere. If not how can they best be repaired. The metal triangle has pulled through the rubber corner. "Hello, I recently inherited a G-Plan "Comfort Lover Group" suite which I know was purchased in the summer of 1967. Does anyone know when they stopped producing this line. I have a brochure from 1968 and it was still around, but I know 1969 was a big year for G-Plan and assume it was dropped then. I have not been able to find a 1969 brochure. "Hi, I bought what I think is a gplan 6250 chair. But it doesn't have a label on it. I've found one on eBay that has a label under the cushion, mine doesn't. Is there anything else that would tell me it's a gplan? Do you know if copies where made of the 6250 chair? "I have some G plan wardrobes and need some new castors that fit onto the adjustable protruding shafts. Do anyone have any idea where I could buy some new/old ones? I have g-plan 'fresco' round table that extends to an oval shape. It was here when we bought the house. Now we need to move and our hallways if fairly narrow so I need to take the table apart. But i can't for the life of me figure out how one can do this without braking the wood glue seal in some places. "I have a pair of Brandon bedside cabinet's, they both have a wooden flap at the top, front of the drawer, I can only think that this is to prevent whatever is in the drawer pinching when the drawer is closed, but don't really know. Would you have any idea?